When this pink and army green skirt arrived in the mail, I knew there was one place I had to wear it: Las Vegas! It's a little bit short for work, but with some black tights it ended up being perfect for strolling along the strip without looking like I was "working" it! I decided to pair the skirt with a black leather jacket and a bright pink cashmere sweater to bring out the lovely contrasting colors. I like how the army green and pink of the skirt juxtapose hard and soft together, which is what I wanted to play off of in my outfit. These pictures might not seem particularly "Vegas" at first, but in the picture above I'm actually standing in front of the new, or relatively new, Prada store at the Crystals shopping center. Every trip to Vegas needs to be accompanied by some serious time spent strolling through the shops, in my opinion. I'm not sure if this is still true or not, but in a book I read years ago about the market for designer goods the author claimed that Vegas stores sell more merchandise per square foot than in any other city in the world. Given this, stores like Louis Vuitton, Chanel and Fendi are always stocked with dazzling goodies that you won't see anywhere else, which makes for some fun window shopping. Unfortunately for my wallet, the window shopping turned into a little bit more than that, as a few things left the stores and came home with me. While this leather jacket I'm wearing is not my first leather jacket, it is my first "biker"-style jacket. Although I didn't think I would be one to gravitate towards this particular style of jacket, it does look lovely when paired with more feminine articles of clothing, such as my skirt. 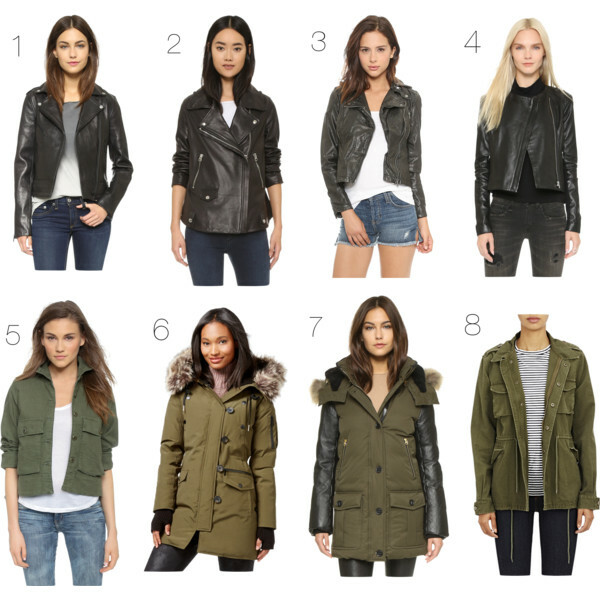 Below are a handful of picks for lovely, buttery soft leather jackets and army green coats that play upon the the "tougher" elements of my outfit. All of these "tough" jackets would definitely look perfect paired with jeans or a feminine skirt. LOVE IT!! Such a fun look with awesome color!! This girly with an edge look is great! That skirt is so pretty, especially with the embellished collared button down. Your tights and shoes are beauties, too! The jacket just tops it all off! love this look. That skirt is fantastic and the touch of pink really softens the look. I agree about the gorgeous contrasts you've got going on here--the leather with the pretty, feminine skirt and sweater make such a great combo. I love how the pink really pops too. A leather or faux leather jacket has been on my wishlist for some time now... got to get one of those! The skirt and sweater are such a cute combination! What a perfect shopping outfit. I was tempted to order this skirt and passed because short and flare does not work for my body type. It looks amazing on you! Cute Skirt! I love the collar details on your shirt! You're a master of color & cuteness! LOVE! Thanks for linking up with Fun Fashion Friday! This is a super cute outfit! I love the skirt with the polkadot tights! Gorgeous, gorgeous, gorgeous! Love your tights and flats. Thanks for linking up with Fabulous Friday, Katie! Great color combo and youve got great legs!! Simply gorgeous in Vegas. Like I said you have the best collection of coats/jackets, sweaters, skirts and shoes. I ordered that skirt from Banana but ultimately it felt too short on me. I love it though. The olive and hot pink camo pairing was superb.